Hello and welcome back to the third installment of our paint along adventure! This time we will tackle the Troll! 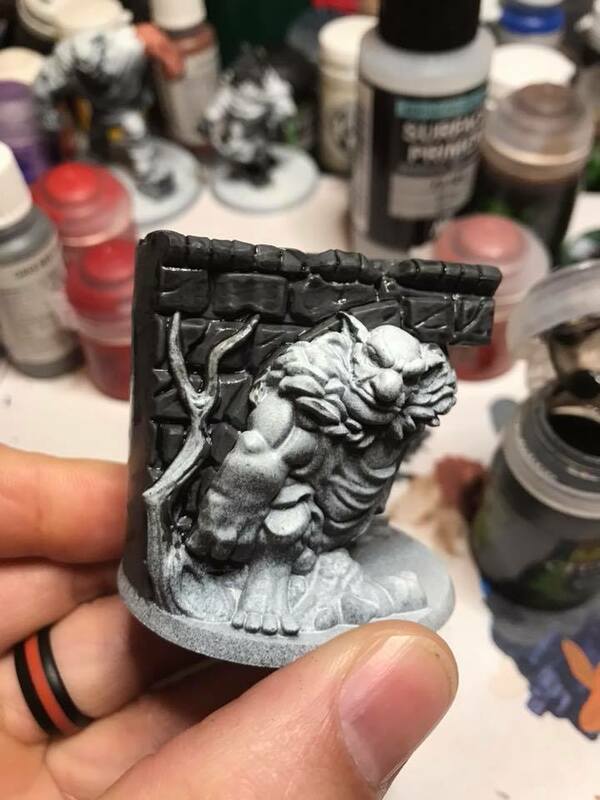 This is a great model in The Grimm Forest to use a combination of techniques. 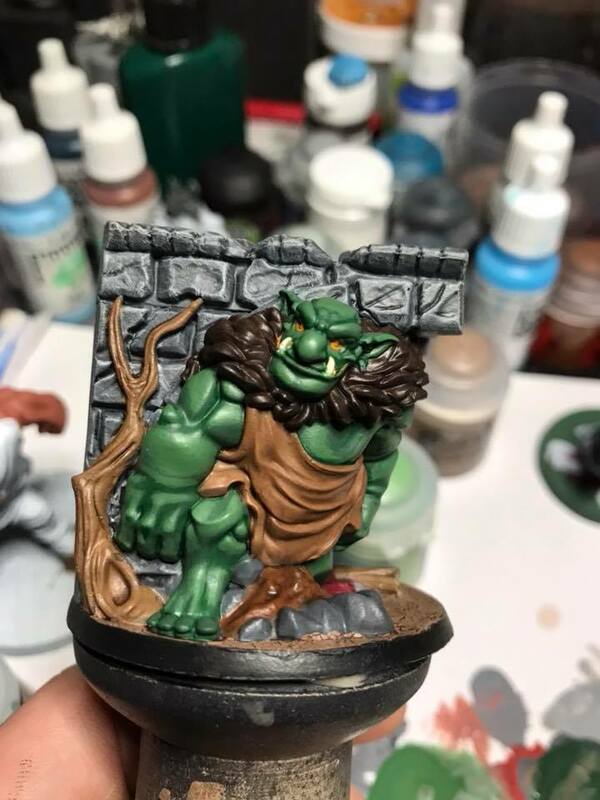 I included a little bit from the first two tutorials, and went one step further into the land of highlighting. If you've missed our previous articles, you can find Part I here and Part II here. Happy painting! 1. I started by base painting all of the stonework grey. 2. Take your time. We want a solid foundation. 2-3 thin coats should do it. 3. I followed by adding a black wash, to define the shadows and mortar. 4. While waiting on the wash to dry, go ahead and paint the eyes yellow and teeth off-white. We will cut in with green later, so it’s okay to be a little messy. Add a light brown wash to both areas. 5. 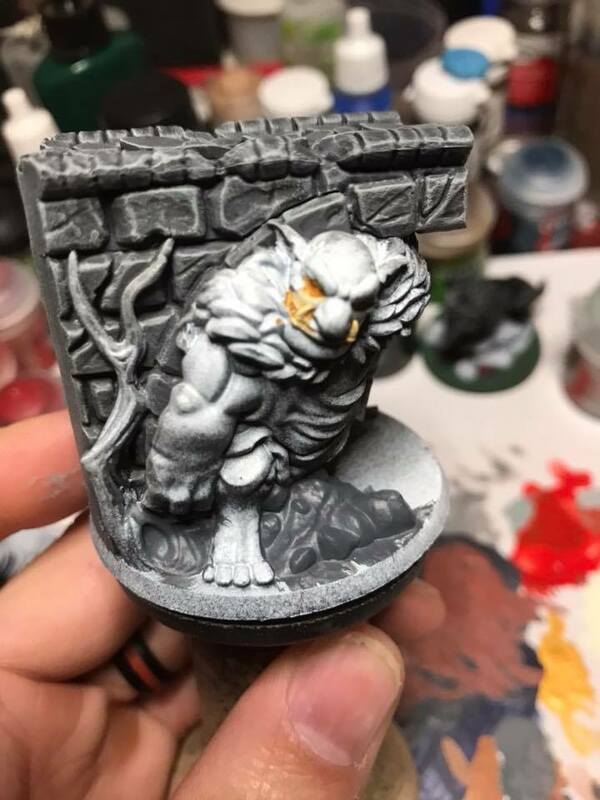 Begin dry-brushing with the original grey. 6. Follow by dry-brushing a medium grey. 7. Finally, dry-brush a light grey. 8. Begin base coating the browns. 9. Don’t forget the logs under the bridge, or the overturned cart. 10. Paint the skin green. There is a lot of skin. Also, don’t forget the troll’s left leg. Take your time cutting in around the eyes and teeth. 12. I painted the tunic a medium brown. 13. The fur collar was painted a dark brown. 14. The tarp on the back was painted a light tan. 15. Wash the tunic, fur, tree, logs, cart, and tarp with a brown wash.
16. Base coat all resources the appropriate colors. I chose to make the wheel silver. The base was base coated dark brown. 17. 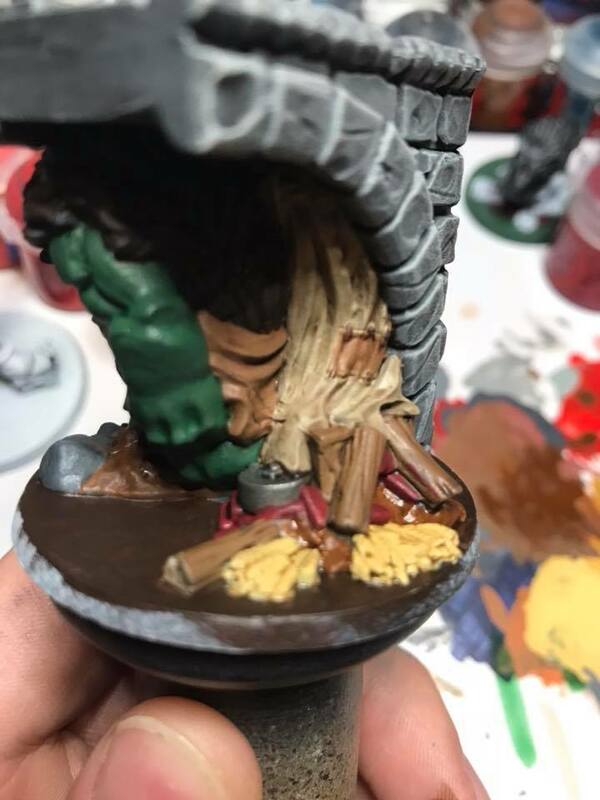 To make the base pop, I used Agrellan Earth by Citadel. This paint cracks while drying. This makes the area under the bridge look like a dried up creek bed. There are all kinds of interesting basing supplies. I encourage you all to experiment. 18. 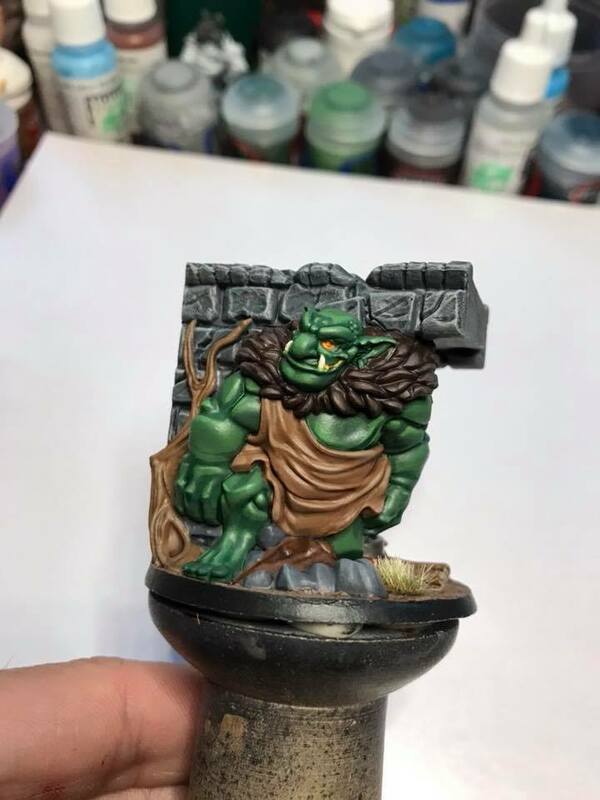 I added a green wash to the skin. I then cut back in with the original skin color, avoiding the shaded areas. 19. I began highlighting with a medium green. Focus on the raised areas of the skin. 20. A lighter green was added to the highest points. Think the apex of a curved area. 21. A lighter shade of brown was added to the ridges/folds of the tunic. 22. The dark brown was lightened, then the fur was highlighted. 23. A shot of all of the browns highlighted. The base is finished. I added a couple of tufts of grass. You can do as little or as much highlights as you wish. 24. Don’t forget to highlight the resources too. To break highlighting down, think of it as a three step process. 1. Base colors. 2. Highlight with a medium variant of the same color. 3. 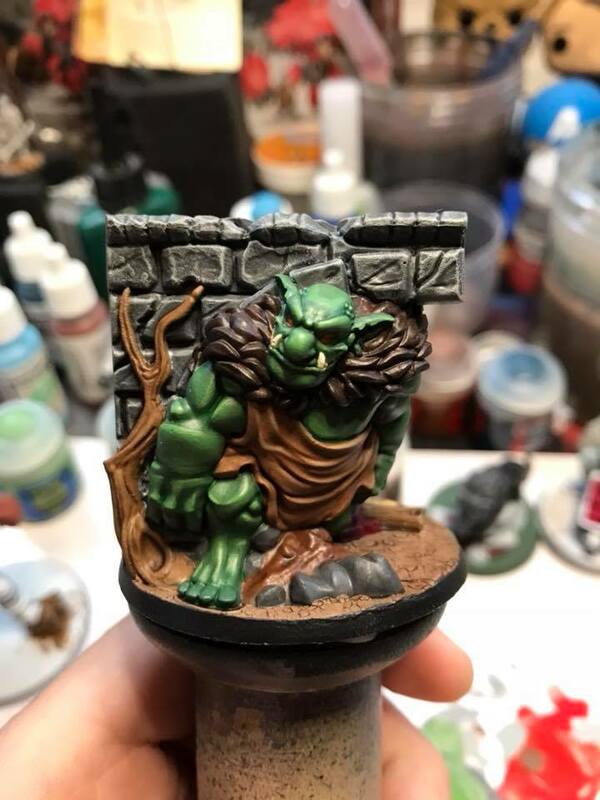 Edge highlight with the lightest variant of the base color. Join us soon for Part IV. Thanks again to JOsh Roe for this fantastic walk-through and Thanks for reading!